For every little girl who ever dreamed of being something great – like a doctor or sharpshooter or astronaut, My Name is Not Isabella, is the perfect reading material. 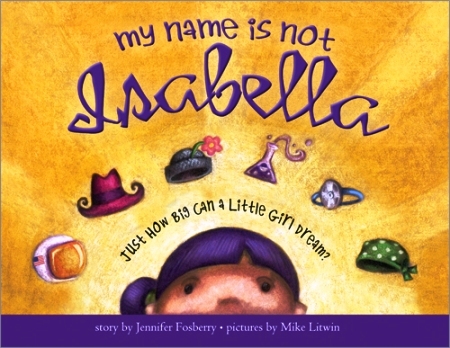 My Name is Not Isabella, by science-geek-turned-children’s-author, Jennifer Fosberry, is the cleverly-written story of a little girl named Isabella who tries on several hats from women’s history to see which one is the best fit. As Isabella’s mother interacts with her through the day, feisty-but-always-respectful Isabella informs her mother that she is not Isabella, but rather some wonderful and inspiring woman from history who changed the world. This brief but extremely sweet K-5 book will leave you feeling warm all over, and not just because the illustrations are rendered in soft and warm earthtones. It is because any reader can see the love and care that has gone into the book, from artist Mike Litwin’s stand-out illustrations to author Jennifer Fosberry’s clever ability to speak volumes about the art of effective parenting and mother-daughter bonding without saying a word about either. If you teach a history class, a girl’s cass, or even a parenting class, be sure to include this book in your list of reading material. Its list of wonderful women from history offers a fresh multicultural view of women’s achievements.